One of the most common issues teachers new to TPRS/CI have is how to start. The neat thing is, that there are ways to start that make it very comfortable (What?! It isn’t awkward to just jump right into Spanish?!) and to help build relationships with our students. Remember, it is in these first days that students make their initial assessment about liking this class or disliking it. Sure, those impressions can change, but why not get off to a good start in ALL ways at once. My beginning of the year is something that, like all ideas, I stole from colleagues (namely Ben Slavic and Scott Benedict, among others). 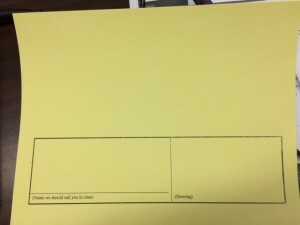 Before students arrive I prepare card stock that will become their name tents. 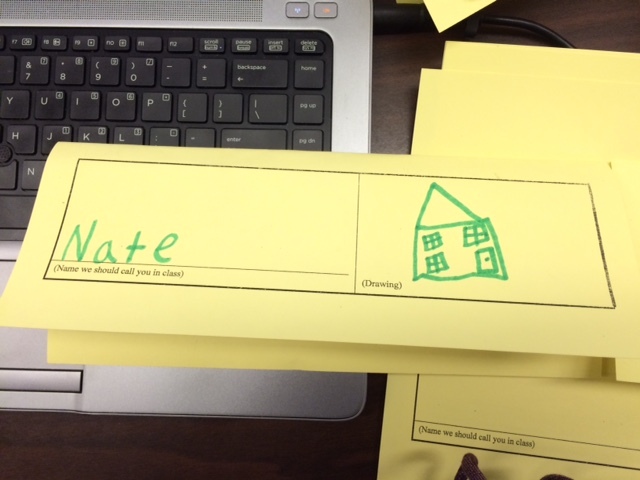 I use the same template in all levels I teach, and construct the same activities in all classes, regardless of level. In Spanish 1 I give students the instructions in English. In 3 and 4, the instructions are in Spanish. But it’s all the same. The great thing is that I can do this with virtually ZERO prep. Which lets me NOT be super stressed as the year begins. #winning! Clearly, Nate would buy a house. I haven’t discussed him yet in class, so I don’t know the details. On the board I put “if I had…”, “if I could…”, “would buy…”, “would have…”, “would be…” in both Spanish and English. I did later end up writing in the “you” form. Then, using circling techniques, I pick a student and ask for details. Maddie drew several cats on her card. Maddie, if you had $1,000,000, what would you buy? One cat or many cats? How many? 2? 10? 1000? Oooh, class, if Maddie had $1,000,000, she would buy a thousand cats. Class, would Profe buy 1000 cats? No, class, if Profe had $1m, she wouldn’t buy 1000 cats. Who would buy 1000 cats? And the discussion went on. She would buy cats of every color, except orange. And tigers are her favorite animal. But she wouldn’t buy tigers. Because she is crazy. She is the crazy cat lady. It would cost $4 total to buy the 1000 cats. Maddie has $4 now at home, but she doesn’t buy 1000 cats now, because of the cost of food. Cat food costs $5/cat/day. So it costs her total of $5000/day to feed the cats. That means with $1m, she can feed the cats for about 180 days. So she doesn’t buy cats now. 500 of the cats would be named Phil, and the other 500 would be named Ellie. And Ally also would buy cats if she had $1m. But Ally would only buy 2 black cats named Spike and Reggie. See, 4 is the limit to be normal with cats. 5 cats or more, you’re crazy. (Maddie is 20x crazy!) So Ally is normal. She will just have 2 cats. In a normal class period, this would have finished the period. I teach on a 90-minute block. BRAIN BREAK TIME!! We got up, stretched and had a 37-second total break from class to talk, look at phones, etc. So now what? I could have easily gone into more interviews, but wanted to change it up totally. So thanks to Carrie Toth, I used a lesson designed by a colleague to do movie talk, embedded reading, and a cloze activity on this commercial for a bank. And, without even stretching at all, we were able to have some of the things from class come up in the video! How much WOULD that many marshmallows cost?! It was great. And I noticed that I have one gal (Ellie) who drew ONE dog, and another (Avery) drew several. So on day 2, you KNOW that we also talked about what it takes to be a crazy dog lady. Apparently, the same limit. Avery will buy 10 labradors, 1 named Maddie and the rest named Ellie. And Ellie will have 1 white chihuahua named Willa. Labradors cost $1200, so IF Avery WANTED, she COULD buy 1197 dogs, but she WOULD only buy 10. White chihuahuas cost $837.22, and Ellie only WOULD BUY one. This is great, Kelly! Thanks for sharing. It’s great when the kids are having fun as well!